Recently, Ansteel succeeded in developing 200 tons of T10A hypereutectoid hot-rolled coil with carbon composition up to 1%. Ansteel claimed that they are China's first mill in this field to fill the domestic blank. Thanks to its high wear resistance with higher added value, T10A hypereutectoid hot-rolled coil, as a kind of tool steel, is often used as raw material for tool knives like steel tape and surgical blade. Due to the high carbon content of the steel, smelting and rolling is so difficult that there is no precedent for domestic production and supply. The first lot of 200 tons has met the user’s requirements for chemical composition, inclusion, decarburization layer, microstructure and properties, surface quality and other technical indicators. Yang Caifu, Director of the Institute, and Su Hang, Ph. D, came to Steel CLIK Shanghai office for a visit this morning despite the scorching sun. Allan Liu, founder and CEO of Steel CLIK held the meeting with topics discussed by the experts present, covering special steel, E-commerce, platform operation, etc. Representing Steel CLIK, Justin Din, Director of MRO, Sandra Gu, Head of Risk Control and Thomas Jiang, Head of Supply Chain had their say at the meeting. Founded in 1952, CHINA IRON & STEEL RESEARCH INSTITUTE GROUP (CISRI) is among the first 103 pilot innovative enterprises in China. CISRI has been serving as the national R&D centre for metals, the innovation base for key technology in metallurgical industry, and the authoritative agency for metallurgical analysis and test. It boasts 9 academicians of the Chinese Academy of Sciences and the Chinese Academy of Engineering, more than 5000 scientific research achievements, among which 293 were honored with national awards, and 1035 were honored with provincial scientific awards, as well as 783 granted patents. Respected as technical centre in China for metals, CISRI is also a leading solution provider of materials for navy ships, air force, army, air space and nuclear weapons. Bulldozer SD90 developed with Shantui – the largest dozers maker worldwide. YAMAL Project – the world’s largest LNG project located in Russia. Shanghai Yangshan Deepwater Port Phase IV - the world’s busiest port. 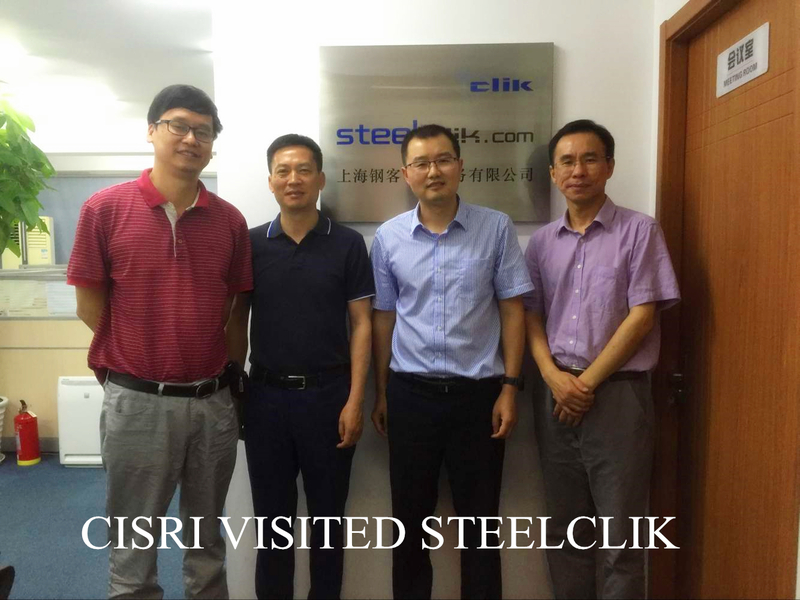 We believe CISRI and SteelClik will join hands to explore domestic and international markets. There’s much to be expected for their brighter future.